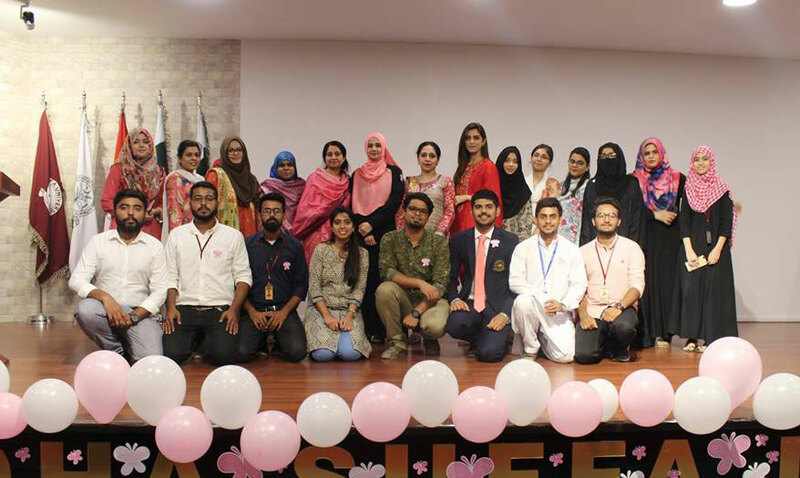 In an endeavor to create awareness among the female fraternity of DSU, including students, faculty and staff members, DSU Women Empowerment Society organized a seminar on breast cancer awareness in collaboration with Shaukat Khanum Memorial Cancer Hospital and Research Centre (SKMCHRC) on October 15, 2018. To show solidarity to the cause, October 15, 2018 was observed as Pink Day in DHA Suffa University. Subject expert, Dr. Rabab Zehra, delivered an informative lecture, which was followed by a Q&A session. She discussed the causes, symptoms and prevention of breast cancer and guided the audience on how to self-screen for early detection. Renowned actress Ms. Maya Ali, campaign ambassador from Shaukat Khanum Hospital, also addressed the audience during this seminar.